Maybe the niggling from here has paid off. 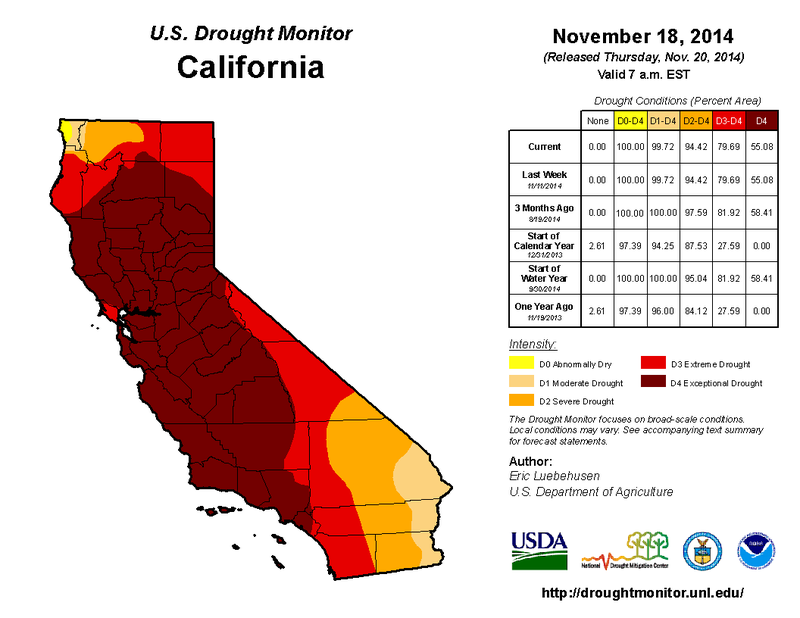 Anthony Watts has finally posted another article on the California drought. Well, WUWT has mentioned it a couple of times before already, in an article about Daniel Swain's recent research paper, and back in January this year, when he proclaimed it had nothing to do with global warming. is not even the 2nd driest water year for California in the last 120 years. Well, well, well. It's only been the third driest year. Nothing to be concerned about after all. Or is it? What Robert found was that back in the 1920's and again in the 1950's there was a year in which there was less precipitation in California. Do those times ring a bell? Do these facts mean that we are in good shape re California’s water supply? No! But we shouldn’t be framing the search for a stable California water supply by starting from a wildly incorrect statement that seems focused on creating public panic. If we begin our search for a solution from reality, it is more likely that we can achieve a realistic long term solution. Nor does Robert have any suggestions to make regarding water security. He's just making a point that California has had droughts before, which is true. And that decisions need to be made for the long term, which I expect the planners in California have already figured out, while they try to cope with the immediate short term demands for water. I'm flat out on other things at the moment so I don't have time to write more about this. I'll just post a few of the well-meaning comments of sympathy and support for Californians from the WUWT readers. I guess it is a much bigger deal now. Back in 1920, California wasn’t nearly as populated as it is now. Maybe the answer is that fewer people should live there. Or maybe they can stop whining about climate change and go find some water. Oh, you said exactly what I was going to say. But I was going to add something about desalination plants. Maybe divert all the windfarms to running new desalination plants and building coal, gas or nuclear to replace them? When it stops blowing you will have stored the electricity in the form of potable water. I think I’ve just solved the unreliability problem of wind and solar. Bolshevictim says to outlaw lawns, which is sensible, and get rid of undocumented immigrants - a completely different issue but one that's clearly a concern to him. Well, my solution is to outlaw green lawns, not only would it reduce water consumption, but demand for cheap lawn service, aka.undocumented immigrants, would be almost completely eliminated. Is 2014 going to be the warmest year on record for California? There are of course different ways of defining drought. If you measure it by the moisture content of the soil, then the amount of water taken out to supply the growing population will mean that droughts will get more severe, whatever the short term variability of weather. Clean water for all IS worth spending money on. CO2 abatement IS NOT worth any spending. That's all I've got time for right now. You can read more here, if you want to. "Proud Skeptic points out that these days there are more people making more demands on the water supply and maybe Californians should stop whining and send some of their residents packing ..."
Correct point, poor conclusion. At the same time, greater demand for water is not strictly a climactic problem which has gotten me curious about exactly what goes into calculating drought indices. Watts presents only rainfall statistics which his (and my) cursory examination does not yield up a compelling claim for AGW-driven drought severity. "The Palmer Drought Severity Index (PDSI, weekly index from CPC shown), devised in 1965, was the first drought indicator to assess moisture status comprehensively. It uses temperature and precipitation data to calculate water supply and demand, incorporates soil moisture, and is considered most effective for unirrigated cropland. It primarily reflects long-term drought and has been used extensively to initiate drought relief. It is more complex than the SPI and the Drought Monitor." So demand is incorporated in the index, therefore it's not strictly a climactic measure. It does occur to me that Watts mostly focused on single-year values, whereas drought is a function of multi-annual trends. Other than that, I'm presently a bit stumped and looking for some pointers. Let us know if you come up with more, Brandon. There is a lot of research material on drought these days. The bottom line question is always fairly clear - is there enough water to go around. Then there are multiple other issues, like depletion of ground water; the impact of higher temperatures combined with drought (and their interaction); how to ration water during a drought and the relative importance of agriculture (a water hog), domestic supply and supply for other uses like manufacturing; and not least of which is electricity production (coal, nuclear and hydro all rely on water) and many more. Living in a drought prone area, I have a lot of sympathy for people who are charged with planning and managing the water supply. It must be really difficult to manage water levels in dams for example, when they are multi-purpose as some are - for flood mitigation, environmental flows, irrigation, hydro-electricity and water storage for dry times. If too much water is released before a drought, then people and the environment suffer more and sooner. If not enough is released and there's a big wet, then people and the environment suffer worse floods. If the ground water is depleted then that can affect all sorts of things, most of them not good. I neglected to mention water for recreation and tourism. That's quite big in non-drought times. When there's a drought - not so much, which can seriously dampen local economies. Eg not so many visitors to drought-stricken regions with local businesses suffering - like suppliers to recreational fishers and boaters, tourism operators, caravan parks and other accommodation providers in particular. What I've read of the CA drought is that the weather patterns that cause the drought are linked to global warming. It wasn't an open and shut case, but seemed convincing enough to believe it had potential. URL... not happening on a Saturday night, sorry, maybe tomorrow. Another review I once read indicated that the US southwest has dried up during regional warm spells in the past, with the Anasazi a victim of one such spell. The PDSI is not the only metric; precipitation over the past few years is low (either as rain, or more importantly as winter snow in the Sierra Nevada). I don't know whether mist in the coastal ranges is affected (the Santa Cruz mountains and others), nor how much water comes from there. The coastal redwoods live off it, I just don't know how much gets into the water supply. 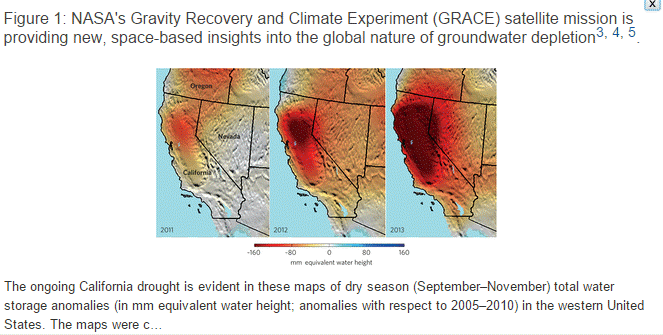 The HotWhopper article I linked to above (re Daniel Swain's research) has links to his paper as well as to the BAMS supplement, which has other papers on the Californian drought and droughts elsewhere. Plus down the bottom there a couple more links that are relevant. From the bottom right of page S4: "Likewise, most of California received less precipitation in 2013 than during any previous calendar year in the 119-year observational record (Fig. 2.1a). Observed precipitation over the 12-month period ending on 31 January 2014 was the lowest for any consecutive 12-month period since at least 1895 (Fig. 2.1c)." From there I was able to figure out where to find the NCDC data for not only precip, but also the Palmer Drought Indices as well, so I'm on my way. Thanks for the help. One of these days I'll succumb to suggestions to start indexing HW articles and the references collected when writing them. HW doesn't hold a candle to the excellent compilation put together at SkepticalScience.com (or the world-renowned IPCC reports which are incomparable, but don't have the very latest research). However there are some really useful references I and HW readers have provided in the few months since it's been going. If this was a scholarly blog I'd probably have done that by now. For the time being the search bar up top is probably the best tool, though that's pretty limited. Tamino had a post on the Palmer index a while back. I just want to point out that the PDSI does not include societal or economic demand for water withdrawals. "Demand" in terms of the PDSI is a technical term reflecting what is called atmospheric demand for water vapor. Atmospheric demand is related to (but not always identical with) potential evapotranspiration. Ignoring that his plot is total precipitiation not average, and that the units are inches not mm, one notes that my plot is showing a low value in 2014 which is clearly unprecedented since 1897. Moore's plot does not and I had to sleep on it to figure it out -- his plot is based on a summary of the data at an annual level whereas I've preserved the monthly resolution in my plot. That he's doing sums and I'm doing rolling means shouldn't make a visual difference, I believe it's strictly down to the time resolution of our respective plots. As well, his plot is summing by the Oct-Sep water year, which is fine since any California resident will tell you that October is when it starts raining. The question is whether if Moore's plot is shonky in any way. As far as I can tell at the moment my answer is no, his charts are legit. As I increase the time frame toward climactic scales a positive trend in mean monthly precipitation emerges. Not really a shocker, I could see it in my first plot as well as in Moore's chart. It actually makes quite a bit of sense to me that it's there, the BAMS report also speaks to this. I'm also going to defer that discussion because the main thing I wish to point out right now is that these data are extremely sensitive to the length of moving average windows. The 360 month MA, like the 12 month, shows 2014 precipitation falling off a cliff in unprecedented fashion. The 60 and 240 month plots are ... meh ... nothing to see here, move along. This is the kind of thing that the Tisdales and Eschenbachs out there have a frigging field day doing with charts. In sum, that it essentially stopped raining in California a year ago and didn't start up again until this week *could be* weather, and I can draw pretty graphs which all but show that it is an isolated event that is anomalous to the actual long term trend. However, the *nuanced* and informed discussion about California drought has more to do with frequency and duration of extremes than running means or totals over arbitrary time periods. Panic is bad, but a sense of urgency when it's due is to be recommended. As my Dad used to say, "If you can keep your head while all around are losing theirs, it could be you've failed to grasp the situation". Watts has failed to grasp most things I've seen him presented with so I doubt this is any different. According to news reports I've heard on KQED (San Francisco NPR station) wells in the central valley are beginning to run dry. This is not a good thing. On the bright side there has been a reasonable amount of rain on the Central Coast over the last few weeks and NOAA seasonal forecasts are for a normal amount of rain during DJF. Unfortunately, as Jan Null (former chief forecaster for the region) points out, the long range forecasts are only barely better than the Farmer's Almanac. Dismal as he states. All I can say is that I am glad I don't live in Santa Cruz anymore. Green lawns? Surely California would have the same kinds of bans on using sprinklers (at all, or only at certain times, or never on lawns only on gardens, or never during middle of the day) that we're used to in other dry places like Adelaide. Our lawn is already dry as toast this year where it was green all the way to Xmas last year - without any watering, sprinkler or handheld. But we've learned to live with that. My personal bugbear is backyard swimming pools. They shouldn't be banned, but they should be covered or otherwise protected from excessive evaporation. Preferably, they should only be permitted where the householder has enough capacity in their on-site water tanks to refill or top-up without using any mains water. Do Californians normally have rainwater tanks filled from their rooftops to supply toilet flushing, laundry, garden watering, and all those other uses apart from human consumption? I'd have thought that was a sensible thing to do. Los Angeles has (historically) much the same annual average rainfall with much the same seasonal variation as Adelaide does - and it's at much the same latitude, barely 100 kms closer to the equator. I don't know what is normal practice in California or different parts of the region, though I think I've read how some places have introduced fines for lawn watering etc. There is always the tension of "freedom" vs social outcomes, more so in the USA I suspect. I recall back in the 1970s being told Australia was a socialist country because (at the time) we had a government-owned telecommunications business. I think that government-owned Australian postal service was mentioned too, for some reason. Though as I understand it the US postal service is also a government-owned business. I was in California in March, in Los Angeles, probably a reasonably wealthy area, and the people across the road from where I stayed had sprinklers on their lawns. Not only that - the sprinklers were running in the middle of the day, and part of their circuit sprayed water onto the road. Also nowhere had low-volume flush toilets, or even dual flush (in fact a while back Watts had an article about installing one in his house, and his readers were astonished at the idea). I wonder if anyone in America is giving any thought to what happens if California runs out of water - or just runs low enough that they can't balance drinking water, agriculture and power...? I just did some sums using data via Peter Gleick's Significant Figures for California, where per capita use ranges from 46 US gallons/day or 174 litres/day to 584 US gallons or a 2,211 litres/day. I compared it to All Australia, with 75,000 litres/year per person or 205 litres/day (54 US gallons), a bit more than the lowest Californian usage - but that's across the entire country. In Melbourne, the average per capita use in 2011/12 (after the drought, not during it) was 149 litres a day or 39 US gallons/day. So even Melbourne, post water restrictions, post drought, was using less than the best places in California in one of the worst droughts on record. Californian individuals could completely stop using any water at all, even for drinking, and it wouldn't make much of a dent. Over 80% of water usage is by agriculture and industry. The fact that fracking operations are allowed to exist (and pump their waste water into aquifers!) is absolutely criminal, but the agricultural systems are also famously wasteful. "There is always the tension of "freedom" vs social outcomes, more so in the USA I suspect." I've always had considerable doubt about that. Their "neighbourhood" committees (or whatever they're called) strike me as the worst kind of pettifogging jobsworths that no self-respecting Australian would allow anywhere near their property. Having Mrs Sniffy from downtheroadroundthecorner knocking on your door telling you to mow / weed/ water your lawn or rip out plants other people dislike sounds like the worst kind of hell to us. But a lot of Americans seem to think this is how suburbia should be. Australians are more inclined to the idea that the suburbs provide us with houses and privacy. Real privacy, where you can shut the door and/or the gate if you choose to and people who don't like your roses/ wattles/ bottlebrushes are perfectly free to not choose them for their own gardens, but we'll plant what we like and prune it if and when we want to. I hadn't considered that aspect, Adelady. A mix of interfering busybody and peer pressure tossed with a dollop of "there is only one way to do things". I wonder to what extent that image is caricature from television series (Desperate Housewives), and how much is real. P'raps a Californian reader will enlighten us. Neighborhood committees? Not sure what you refer to. What we (in CA) do have is a system of local districts (of widely varying size and often independent of cities and counties) that control water use and are responsible for any restrictions to be imposed. The state can lean on them and has recently started to do so. It turns out that rich people with big lawns have lots of political influence, so left to their own devices the elected boards of water districts tend to delay restrictions for as long as possible. I should mention that except in the case of a few isolated spots with purely local supplies, even under the present relatively severe conditions urban users are at little risk of being subjected to really strict rationing. Ag users are since they use the vast majority of water and don't have many votes. The rain we've gotten and will get this month isn't part of our normal wet season, a lot of it being thanks to Nuri and a NE Pacific high that went so far north that rather than block storms it let them in to the south. It will be interesting to see if it builds back in to its more usual location in the next few weeks. In any case, talk of the drought being over or even substantially reduced.is premature until at least January, noting that it rains some in the winter even in very dry years. Any shortfall will start really biting in the late spring and summer. Re the weather pattern I mentioned, it's interesting to see what the jet stream did over the last few weeks. Right now California is set for hosing, but I expect that won't last. In a gated community in the US and Canada, there's typically a committee formed, something like a condo board, which decides on rules and regulations and does some enforcement. The claim is always that the goal is to protect shared property values -- socialism is OK if it makes rich people richer. Enforcement is by threatening to impose fines (I have some personal doubt whether fines are often actually collected). Most people are reasonable, but some unreasonable people get onto these boards and can make very stupid decisions like forcing you to maintain a perfect lawn by aggressively spraying it and watering it, or placing limits on trees, etc. A lot of people find this pretty repulsive. But in the face of the huge crime wave that the TV is constantly talking about (though it doesn't exist), gated communities are popular for the upper middle class and above. My memory is from much longer ago than that. "Coming Home"? Maybe. I certainly remember something about residents' committees and Tupperware parties from some 1970s film or another. Oh, "Coming Home." That had a military base setting, so isn't representative..
What adelady is referring to are committees based on homeowners associations. In the US, the standard pattern for developing the suburbs has for years (since the late 1800's in the Midwest at least) has been the platted subdivision, laid out by one developer who puts in the streets and (since the 1950's probably) the utility lines. Since the developer starts out owning all of the land, it can impose restrictions (reciprocal negative easements, to be technical) that bind all the land and all future owners. Any lot owner can enforce the restrictions against any other. Since the 1960's or so, these restrictions have also included formation of a homeowners association, which has the authority to enforce the restrictions and usually the ability to create new restrictions including architectural and landscape controls. Because these new restrictions are adopted by majority vote of the lot owners, most of the time there don't seem to be too many problems, but the structure does lend itself to abuse by nasty neighbors. This pattern applies to subdivisions, gated communities, and especially condos. In addition, sometimes municipalities will impose limitations on what kind of plants can be used in landscaping. Sometimes the restrictions make sense (native plants only) and sometimes they don't. A big factor in the restrictions is promoting uniformity or at least coordination of architecture and landscaping on the various lots. Whether this is a good thing or not is a value judgment and probably depends on the circumstances. But there is a song about California: "Little boxes on the hillside, little boxes made of ticky-tacky, and they're all made out of ticky-tacky and they all look just the same." Oh, aha. Indeed there have been cases in CA of people wanting to switch to xeriscaping getting flak from their neighbors, whether formally through a homeowner association or informally, based on the idea that a neat, uniform appearance enhances property values. But in recent months, as the drought has deepened and the state has started turning the screws on profligate water use, I've heard little of that sort of thing. Word of the change in attitude has even reached the Torygraph, which ran this article a couple months back. Strange article, and a wandering discussion. If the discussion is about whether the current Californian drought as recorded so far, can safely be blamed upon AGW, it would appear that the answer is, "No". Does that mean there is no such thing as AGW, or CAGW? Again, no. Rat lives in Mendocino County, third on the north coast. So far, it's been a good rainy season. Right now, we're at the average for Nov. 30, with almost 6 inches this week. Last year, we had 1.4 inches total for Nov and Dec. So far, it's also our hottest year ever, 4.2 dgrees F above average. I usually get frost by mid Oct; this year, my first and only was last week. Careful with that logic. It implies that weather isn't a consequence of the climate. Climate change is a pretty maddening issue as it is, but living in the US North East (Pennsylvania), I can't say that we are suffering from it at the moment. If anything, last few summers have been cool and rainy, and winters have been good too (if you like snow). That said, I know from personal experience that drought is very stressful on people who care about their environment. Signs of distressed wildlife are everywhere to see for those who care to pay attention. The narcissism on display at WUWT and similar venues must be even more aggravating. A few hundred years ago Natural Science was all the go. it was no more than stamp collecting but still important. It gave science a data set that could be fitted to some sort of logical framework. All the data collected by early geologists and naturalists finally culminated in plate tectonics and the structure of DNA only about fifty years ago. We now know the structure of the Human Genome at a molecular level. In this Human Genome we can see the whole history of Evolution. Yes we still have the genes of all our ancestors quite visible in the sequences of our genome. Without about three billion years of bacteria performing random experiments most of the functions that give us life and consciousness would not exist. I find it rather odd that people who say we are the pinnacle of god's creation can ignore their own utter ignorance when challenging real evidence.